I always do my best to spread the word in regards to stolen equipment since it’s usually a potential buyer that tips off the rightful owner or the authorities of suspicious gear. As many of you know, Duclos Lenses was a victim of theft a few years back which set us back in early development of our 11-16mm lens. As a result, I take thefts such as this very personal. This time it involves a complete set of Leica Summilux-C Primes owned by a great rental house and customer of ours, CPT Rentals out of New York. The lenses were being used in the Angelino Heights area of LA at the time they went missing. CPT is distributing flyers that share a few other details that are important to spread including the name of the detective investigating the crime: Craig Marquez of the LAPD (case # 13022294) who can be reached at (213) 484-3479. The serial numbers of the lenses are as follows. 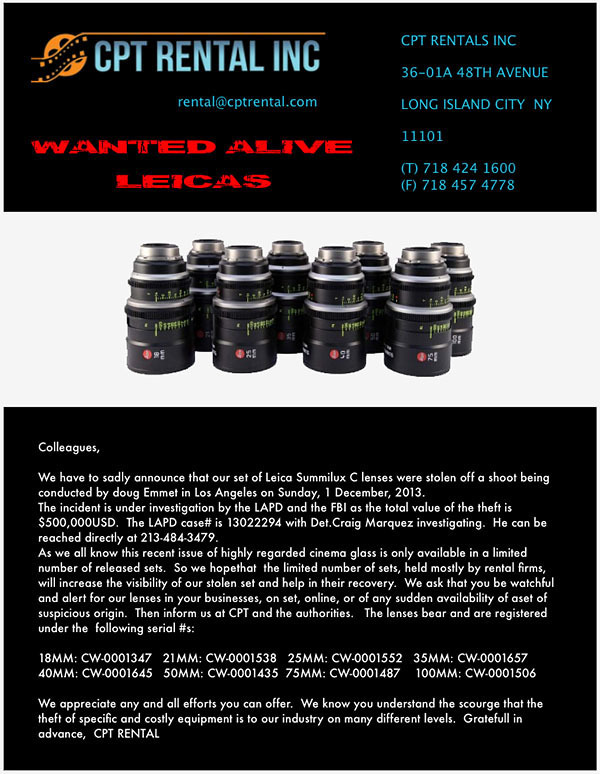 We strongly urge you to share this information with as many people as possible to get these beautiful lenses back to their rightful owner, CPT Rentals. If you have any information, please contact Detective Craig Marquez at (213) 484-3479 (case # 13022294) or CPT Rentals at (718) 424-1600. I put your message put on my blog.